A trip to Oklahoma last October with several of the Gene Larew/Bobby Garland pro staffers provided good access to several of the country’s best fishermen. A few hours on the water with Jacob Wheeler, a 26 year old from Indianapolis, Indiana, provided insight into the heart of a young, aggressive bass fisherman. Wheeler has successfully fished several of the pro circuits reaching levels many of his competitors only dream of reaching. His biggest claim to fame, so far, is winning the 2012 Forest Wood Cup Championship and being the youngest pro fisherman to reach $1,000,000 in winnings. 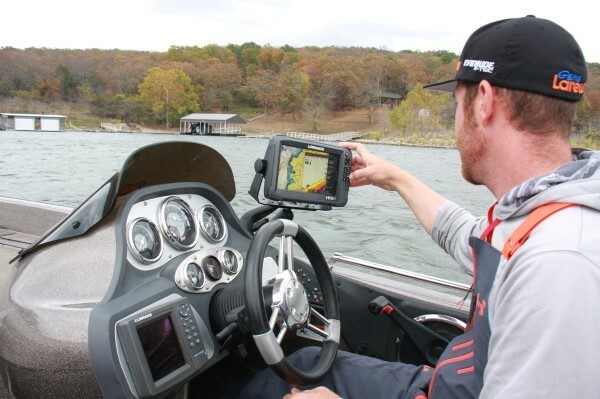 Electronics is the key to catching any species of fish. 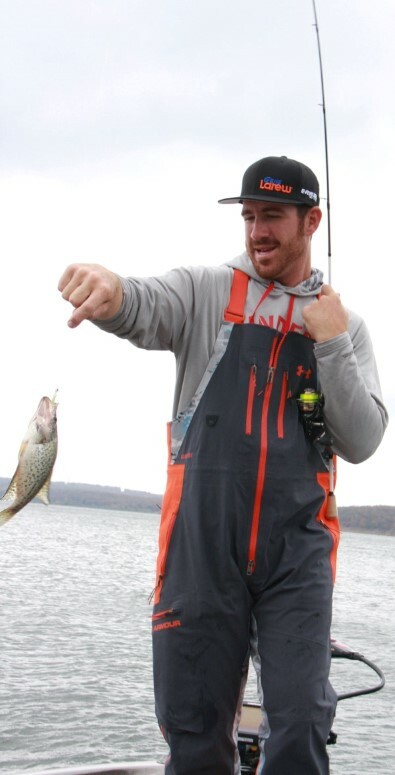 Wheeler finds the right spot before he considers picking up his rod. So why feature a bass pro in CrappieNow Digital Magazine? Because Wheeler is an avid crappie fisherman. He says he has the opportunity to crappie fish about ten months a year but has to work trips in around a busy schedule. 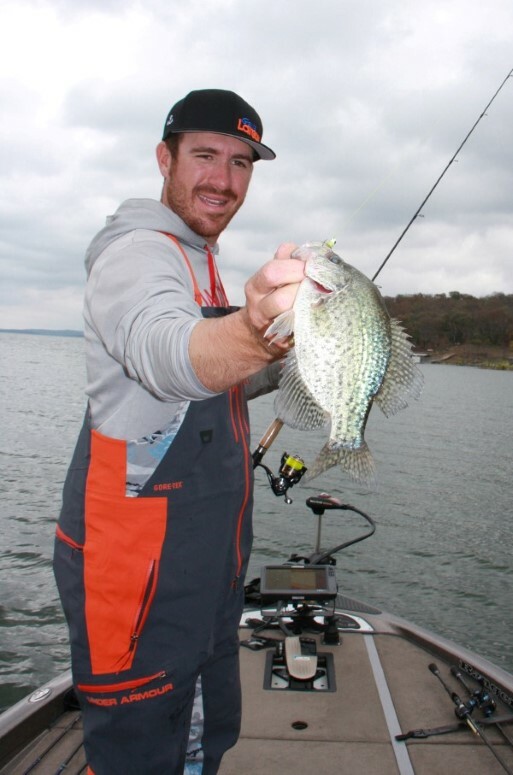 Now through December is a good time to search the ledges following the crappie as they move into deeper water. In October they will still be relatively shallow in the 12 to 22 foot range. In December they’ll be 25 to 30 feet deep along the ledges. The good news is they will usually be schooled up so catching numbers of fish isn’t unusual. On a good day you can expect to catch 40 or 50 crappie. On a slow day here you can zero. Both wood and rock formations are important. Find either one in the right depth zone and you’ll hook up with fish. Baitfish is also an important factor right now. Without them you will not find the crappie. 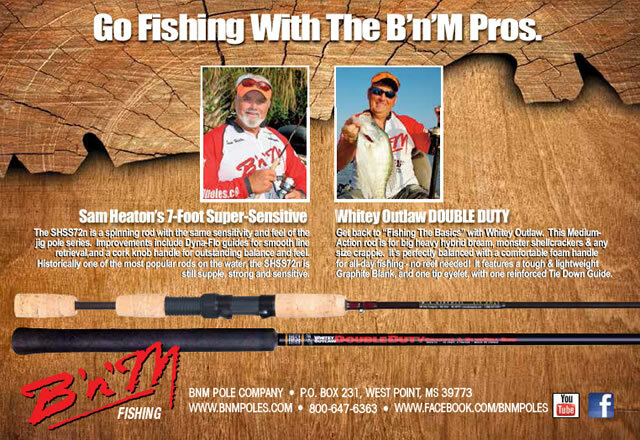 When going deep it’s best to stick with light 4- or 6-pound test line. A jig will drop faster, you’ll have better control and you’ll get more bites the lighter you go on pound test. Natural colors or white works on Ft. Gibson, as do other colors. One trick locals like to do is glue the body to the jighead. When action is fast having a body that stays on the jig in the deep water is a big advantage. The Bobby Garland Baby Shad and Swim’R are both popular choices at Gibson. His favorite technique in the spring is casting jigs up on a flat. He enjoys the fun of basic fishing with a jig or jig-float combo. His summers are filled with bass tournament but he gets back to the crappie in the fall and winter. Jigs include usually mean 1/16 and 1/32-ounce, but a larger 1/8 when necessary. As the water gets cold getting the jig to the bottom is important. He believes a lot of crappie fishermen miss this important point. In this situation he uses a 1/16-ounce on calm days and 1/8-ounce when it’s windy. Bass Pro Jacob Wheeler earns his money bass fishing but often switches gears to crappie to unwind and have fun. He keeps everything as simple as possible starting with his line. Mr. Crappie 4-pound high-vis yellow line allows him to see the line while the small jig falls faster on light line and longer casts can be made. His favorite jig is a Bobby Garland Baby Shad in black-chartreuse or blue-chartreuse. Those colors work almost anywhere that water has some stain. “There are a lot of similarities that people should realize. Both fish are opportunistic feeders and they will set up where they can eat. Some of my best crappie spots are also my bass holes. When asked if other bass fishermen give him trouble about his crappie fishing, he said, “Oh my! In the fall the deer are moving and smallmouth are biting but I’ll take a day and go crappie fishing. My buddies are telling me I’m crazy. I just tell them I’m catching 150 crappie a day. You may or may not see a deer all day but I know for sure I’ll catch my 150 crappie. I love it. You can follow Jacob Wheeler on facebook and twitter.